Microtips in Rack Sterile is unique boxes are moulded in Polypropylene and are therefore autoclavable. The Box it self is clear in providing an excellent view of the tips inside while a table like structure is provided inside to hold the tips. The tip holding spaces are uniformly placed to facilitate the use of multi channel pipettes. The cover is joined to the base through ball catcher hinges and provides excellent protection to the tips. 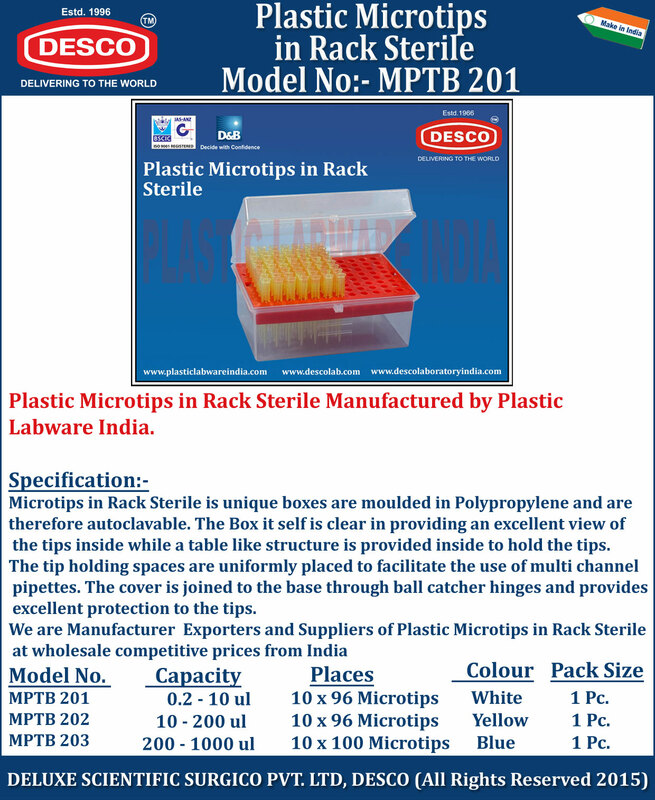 We are Manufacturer Exporters and Suppliers of Plastic Microtips in Rack Sterile at wholesale competitive prices from India. MPTB 201 0.2 - 10 ul 10 x 96 Microtips White 1 Pc. MPTB 202 10 - 200 ul 10 x 96 Microtips Yellow 1 Pc. MPTB 203 200 - 1000 ul 10 x 100 Microtips Blue 1 Pc.